Travelers to Dry Tortugas National Park have to fly or sail about 70 miles in order to visit this island beauty. Located closer to Cuba than to the U.S. mainland, many people are unaware that this isolated national park exists. The Dry Tortugas are at the very end of the Florida Keys. Dry Tortugas National Park is an underwater wonderland. Diving and snorkeling are popular activities in the park, but the park does not provide resources for these activities. There are some commercial vendors that provide rentals and sporting goods. Boating is another popular activity here. All vessels in the park require free boating permits, which can be obtained from the Garden Key Visitor Center or Park Headquarters Office. Fort Jefferson is a must-visit site at Dry Tortugas National Park. Abandoned in 1874 and never completed, the fort nonetheless has a long and varied history. During the Civil War the unfinished fort was used by Union warships to block Southern shipping. It was also briefly used as a remote prison. As a prison, the fort housed famous inmate Dr. Samuel Mudd, who set Lincoln assassin John Wilkes Booth’s leg. Later, it was used as a coaling station for warships. The park offers ranger-led tours of the fort, but visitors can also take self-guided walking tours. The park is open year-round. The fee to enter the park is $5 for visitors 17 and older, and allows access to the park for seven consecutive days. The park is only accessible by boat or plane, so visitors should plan accordingly. There are no services in Dry Tortugas National Park, so visitors should be sure to bring everything that they need with them. If visitors plan to stay overnight, camping is the only lodging option. Visitors should come very prepared, since the islands are very remote. There is a primitive campground with 10 sites on Garden Key. Camping is $3 per person per night. The sites feature grills and picnic tables. Campers must provide all food, water and shelter necessities. If all campsites are occupied, there is a grassy overflow area located near the other sites. Please respect the park’s quiet hours from 6 p.m. to 10 a.m. In 1991 the Dry Tortugas National Park began the Nurse Shark Research Project. Park researchers, along with researchers from Mote Marine Laboratory, Albion College, and Southern Illinois University work alongside to study the population, distribution, life cycles and migratory movements of nurse sharks in the park. There are lots of nurse sharks that live in the park’s waters, but they are of little concern to swimmers since they are not aggressive by nature, and rarely attack humans. Researchers tag the sharks on their fins to better monitor shark habits. Since the program’s inception, researchers have gained considerable knowledge about the sharks, including the fact that many nurse sharks spend their entire lives in the park’s waters, while others travel hundreds of miles only to return. The Dry Tortugas were discovered by Ponce de Leon in the early 1500s, and subsequently became a crucial stop on the trading routes traveled by Spanish ships to and from the coast of Florida, Vera Cruz and the Caribbean. Shortly after the U.S. acquired Florida from Spain, the U.S. military started surveying the Dry Tortugas as a potential site for a naval base. It was decided that the islands were suitable for a lighthouse that would help guide ships around the reefs and small islands. The lighthouse was constructed on Garden Key in 1825. The construction of the military fort, Fort Jefferson, didn’t start until 1846. The largest all-masonry fort in the U.S., Fort Jefferson was intended to protect the nation’s gateway to the Gulf of Mexico. The onset of the Civil War delayed construction, and the fort was never completed. 1513 – Ponce de Leon discovers the Dry Tortugas. 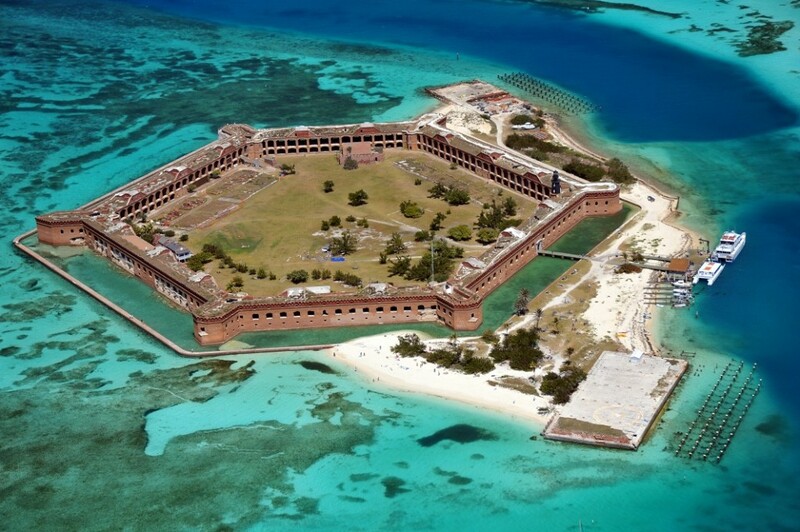 1822 – The U.S. acquires Florida, which includes the Dry Tortugas, from Spain. 1905 – The Carnegie Institute’s Laboratory for Marine Biology is established on Dry Tortugas. 1908 – Executive Order establishes Dry Tortugas Keys Reservation to protect sooty tern rookeries. 1935 – President Franklin D. Roosevelt establishes Fort Jefferson National Monument. 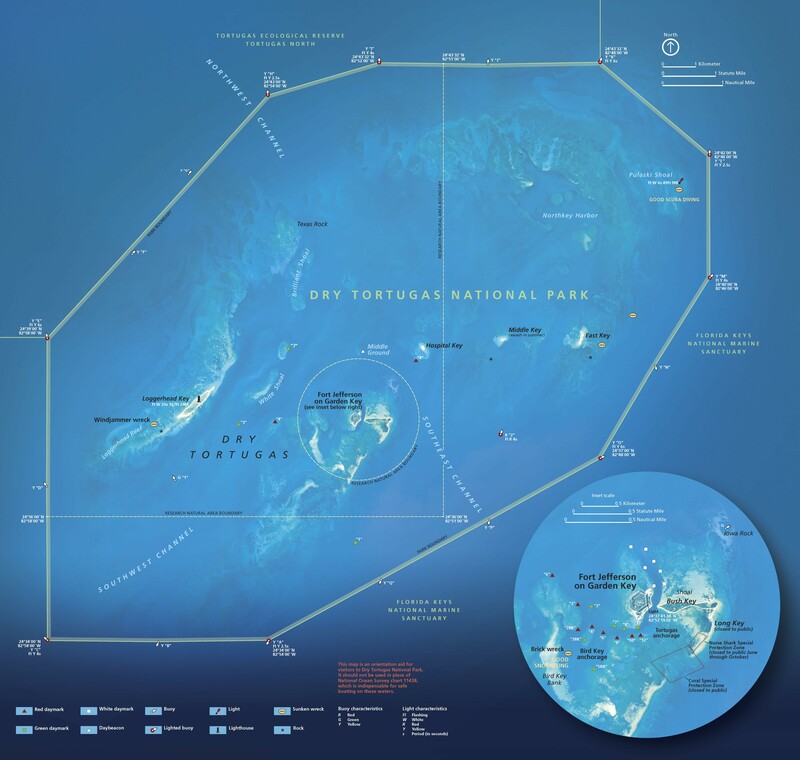 Click to see a detailed Dry Tortugas National Park map.